HANOI, Vietnam, July 2, 2010 (ENS) – Just 30 wild tigers survive in Vietnam and poachers are going after those, but the country’s newly established Environmental Police were able to put a stop to some of the illegal trafficking last week. Members of the Environmental Police confiscated two frozen tigers and a frozen panther in the central province of Nghe An. The animals, along with five kilograms of suspected tiger bones, were confiscated from the home of a 53-year old man in Dien Chau district and the suspect was placed under arrest. TRAFFIC, the nonprofit wildlife trade monitoring network associated with WWF and the International Union for the Cosnervation of Nature, commended the authorities for their diligence in enforcing Vietnam’s wildlife laws. “The Environmental Police have demonstrated once again their dedication to halting the illegal trade in protected species such as tigers,” said Thomas Osborn, coordinator of TRAFFIC’s Greater Mekong Program. In March, Lao Bao Border Guard Police seized a body of a tiger and a black panther being transported across the border to be sold in Vietnam. 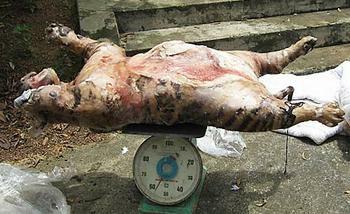 In October 2009, Vietnam’s Environmental Police seized two frozen tiger carcasses and arrested five suspects in Hanoi. In July 2009, the police confiscated another frozen tiger and more than 11 kilos of tiger bones transported into Hanoi by taxi. 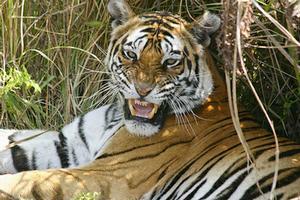 There are about 3,200 tigers left in the wild anywhere in the world, with around half of these in India. Tigers and panthers are protected under Vietnamese and international law, but they are still illegally hunted and traded across Vietnam and Southeast Asia for their meat, as souvenirs, and for their bones, used in traditional medicine and to make tiger bone wine. Authorities in Thailand also are strengthening their ability to intercept wildlife smugglers. Wildlife checkpoint officers in southern Thailand and more than 50 airport staff from Hat Yai International Airport, including check-in counter attendants, baggage handlers, customs and immigration officers, police and security officials, have just completed four days of intensive training to detect and stop wildlife trafficking in the region. The course was organized by the Royal Thai Government and hosted by the Department of National Parks, Wildlife and Plan Conservation. 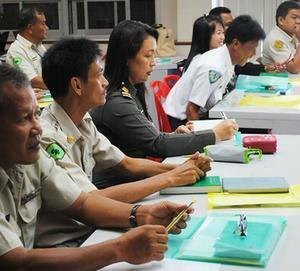 The training was based on the Wildlife Trade Regulation Course developed by TRAFFIC Southeast Asia as part of the U.S.-funded support program for the Association of Southeast Asian Nations Wildlife Enforcement Network, ASEAN-WEN. Meanwhile, on June 22 and 23 in Bangkok, members of the Asia Regional Partners Forum on Combating Environmental Crimes met to develop more effective ways to tackle wildlife crime in the Asia-Pacific region. 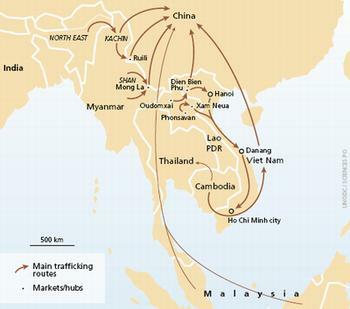 “Porous borders that facilitate illegal trade, ineffective laws, weak enforcement, a lack of knowledge and coordination among the enforcement community,” add to the problem, the ASEAN-WEN group acknowledged. At the Bangkok meeting, participants reviewed a new United Nations report entitled “The Globalization of Crime,” which warns that tigers and black rhinos may become “extinct in the wild” as a result of illegal trafficking. “Tigers are also smuggled across the Himalayas into China with important retail centres in Linxia, Xining, Lhasa, Nagqu, Shigatse and Litang,” the report states. Tiger parts continue to fetch high prices, the UN report finds, with skins retailing in 2009 for up to US$20,000 in China, and raw bones selling for up to US$1,200 per kilo. “A single kill would represent a large amount of money to individual traffickers in the region, because they are relatively close to the destination market, and so could be expected to earn a good share of the final retail figure. As a result, the incentives for poaching and trafficking remain strong,” states the UN report. In January, the State Forestry Administration of China has issued a directive calling for increased protection of wild tigers through natural habitat management, stronger law enforcement action against illegal trade in tiger parts and products, stricter regulation of captive breeding regulations and enhanced public awareness campaigns. Tigers have become a global icon for species on the brink of extinction, especially during the current Chinese Year of the Tiger. TRAFFIC, WWF and others are working this year to secure political commitments that will double the number of wild tigers by the next Year of the Tiger in 2022.